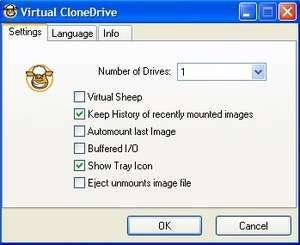 Virtual CloneDrive is a completely free tool for Windows which allows you to create up to 8 different virtual disc drives. The drives may be either emulated CD or DVD. The main point of running an emulator such as this is to help increase the life of discs, especially if they are used very often. Simply create a dump of your CD as an ISO or BIN image and you'll instantly be able to mount it as a virtual disc drive with this freeware application. Version 5.5.0 is a freeware program which does not have restrictions and it's free so it doesn't cost anything. For security reasons, you should also check out the Virtual CloneDrive download at LO4D.com which includes virus and malware tests. Additional screenshots of this application download may be available, too. Virtual CloneDrive has a presence on social networks.